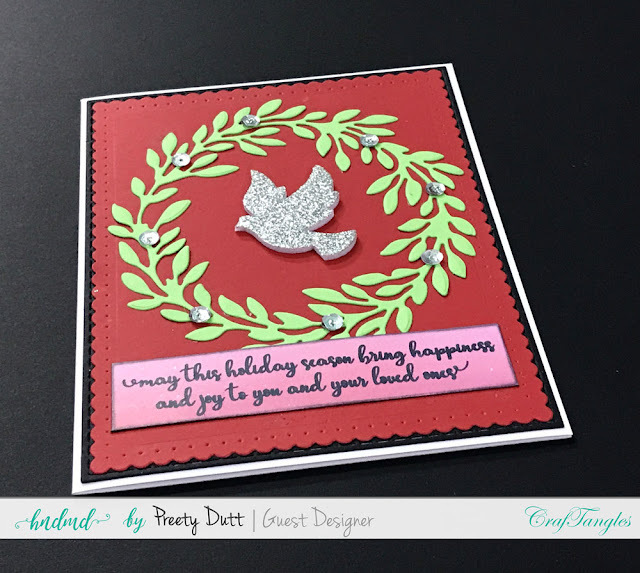 Preeti Datta (aka Dutt Preety) here. 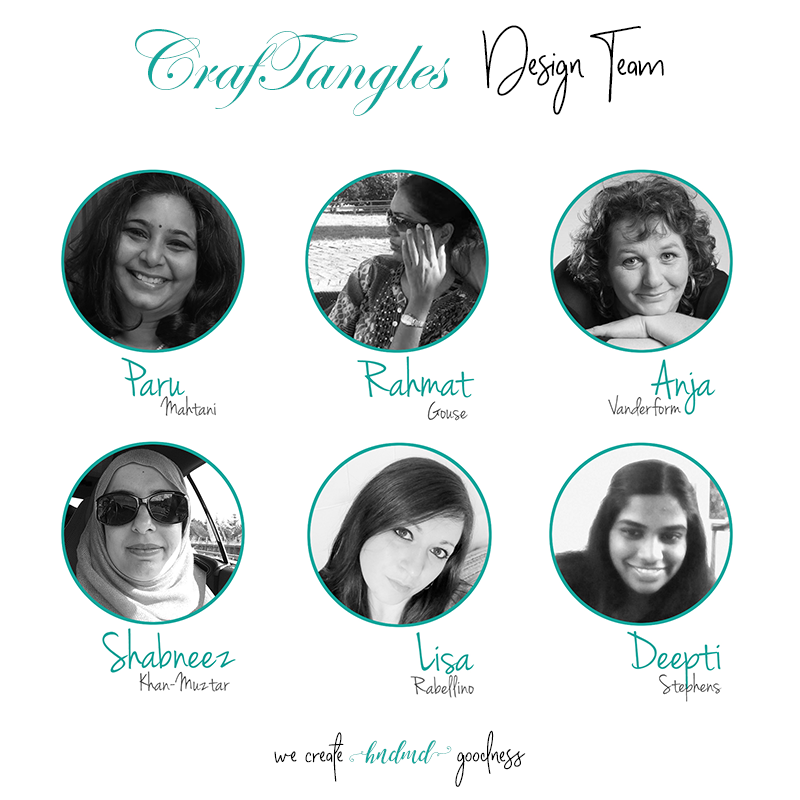 Firstly, I’d like to give a big thanks to Khyati for inviting me to guest design. I enjoyed playing with the cute Christmas supplies. 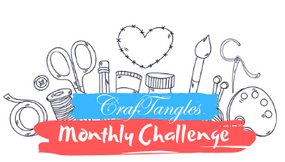 If you’d like to see more of my crafty ideas and projects, these are my social media links. Since it is the holiday season, I’d like to wish everyone a Merry Christmas and a Happy New Year well in advance. 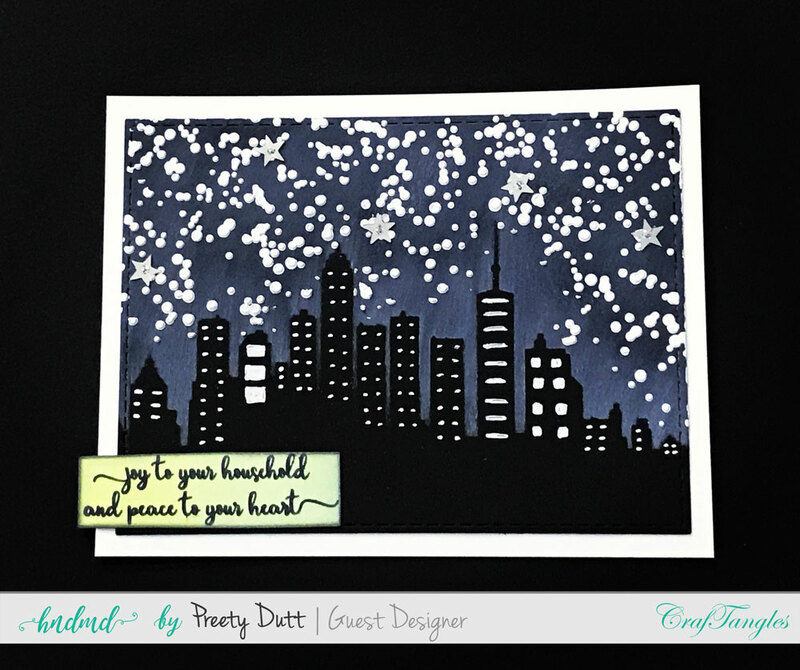 For this card, I wanted to create a night time snowfall scene, so I used the CrafTangles Skyline Stencil which has detachable pieces that can be used as masks. So I used the skyline mask to mask off the black cardstock and sponged on picket fence distress ink onto the rest of the cardstock. Then I added the windows with a white sharpie. And then to create the snowfall, I applied White Gesso through the CrafTangles Speckles Stencil. The sentiment was stamped from the CrafTangles Seasons Greeting Stamp. I added a few silver star sequins to finish the card. For this card, the focal element is the cute reindeer, I sponged it on using Black Soot distressink, a sponge dauber and CrafTanglesChristmas Elements stencil. 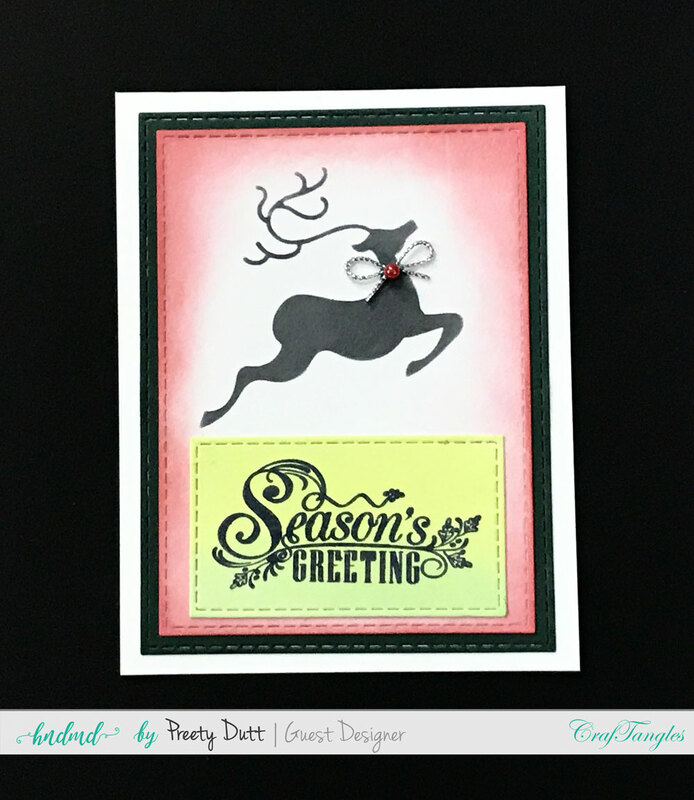 The sentiment is from the CrafTangles Seasons Greeting Stamp. 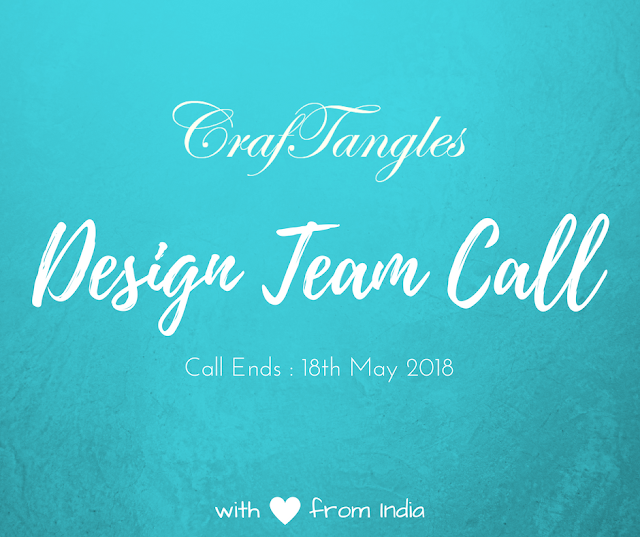 CrafTangles Moss Green Cardstock was used to create the mat. For embellishment, I added a little silver bow and red pearl to the neck of the reindeer. 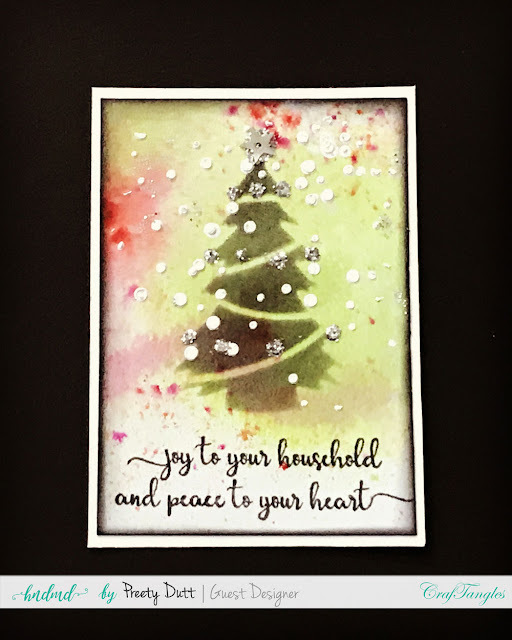 For this card, the soft green background was created by sponging on the christmassy images from the CrafTangles ChristmasBackground Stencil using Cracked Pistachio Distress Oxide. 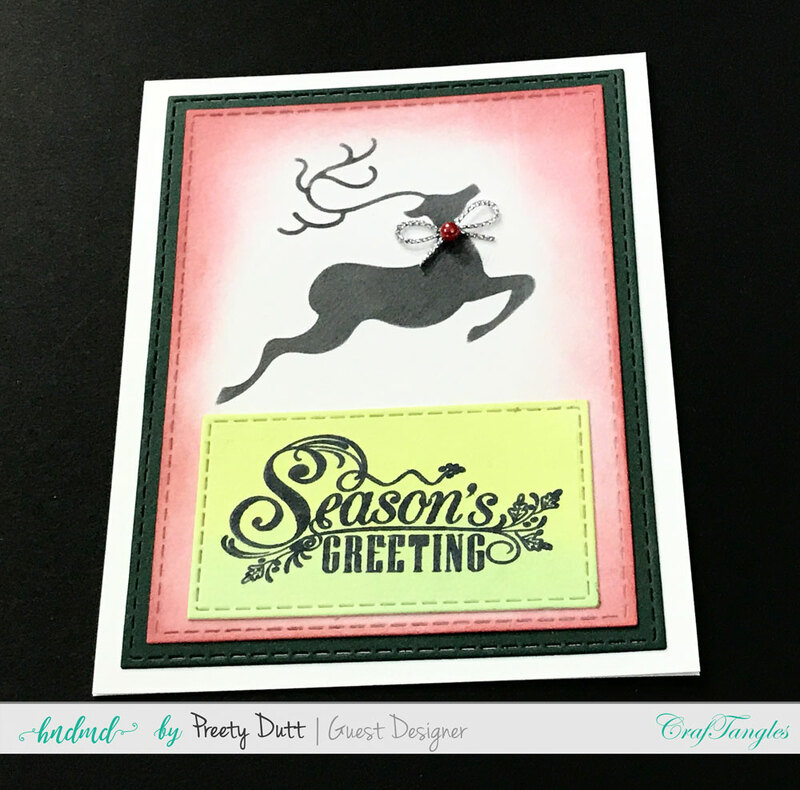 The sentiment was stamped from the CrafTangles SeasonsGreeting Stamp. 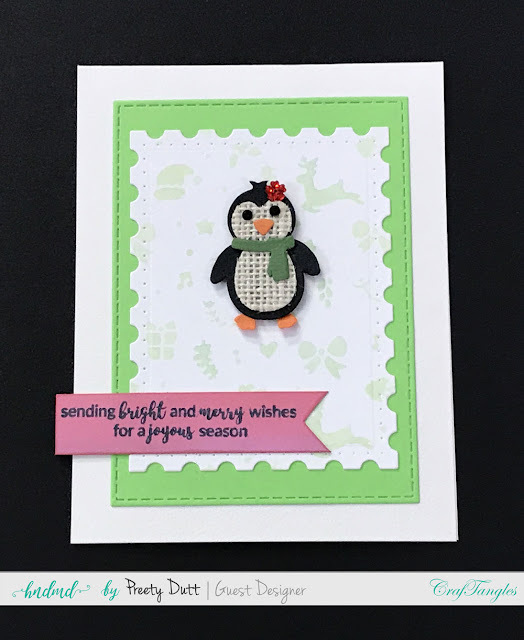 I used a cute little penguin sticker as the focal element of this card. 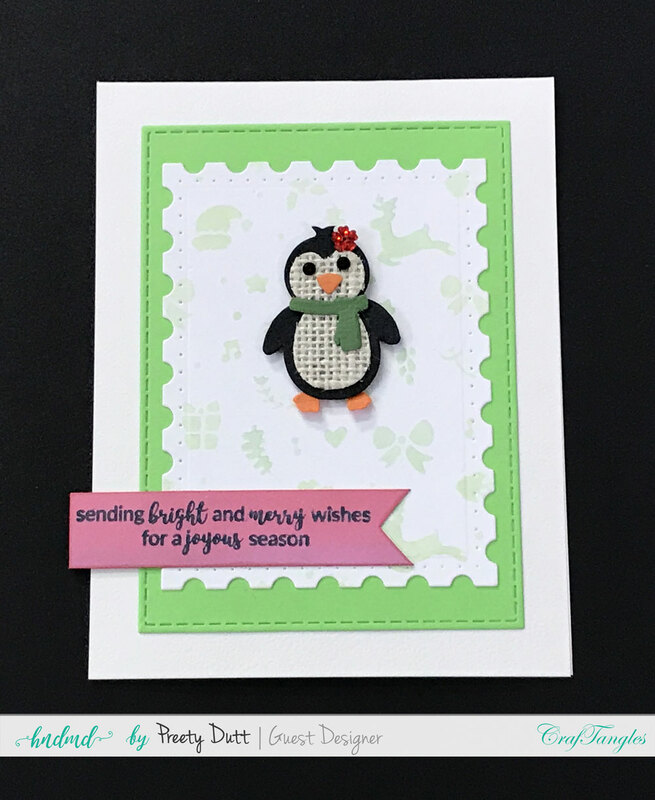 The bright green pop in the card is from CrafTangles Sap Green Cardstock. 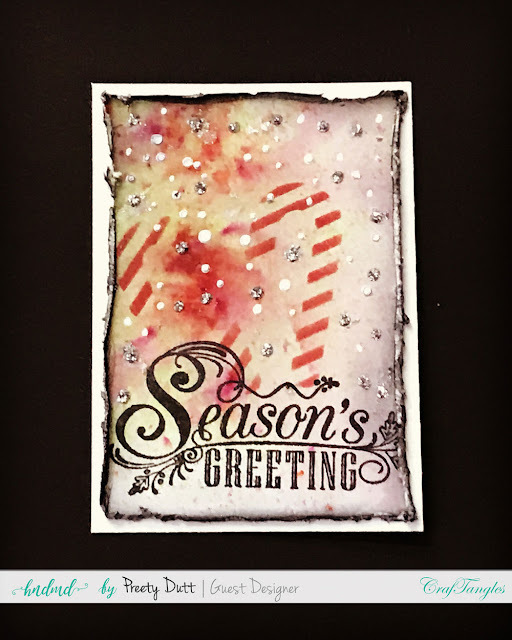 For this card, CrafTangles Ruby Red Cardstock was used to die cut the main card panel. 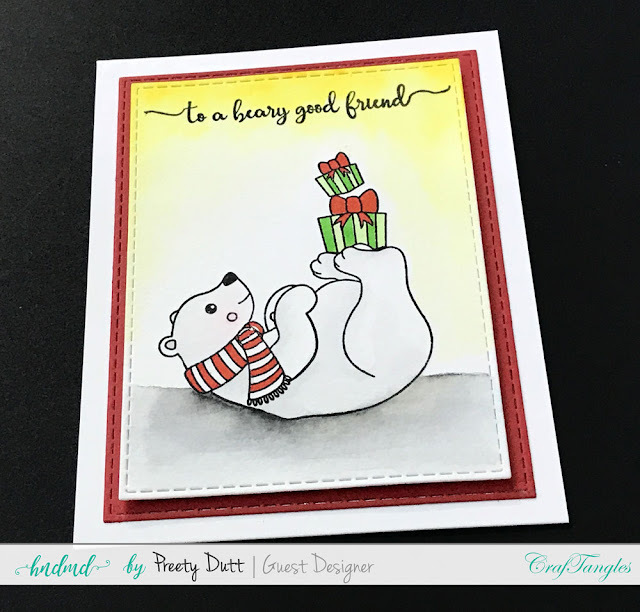 The sentiment is from the CrafTangles Seasons Greeting Stamp. 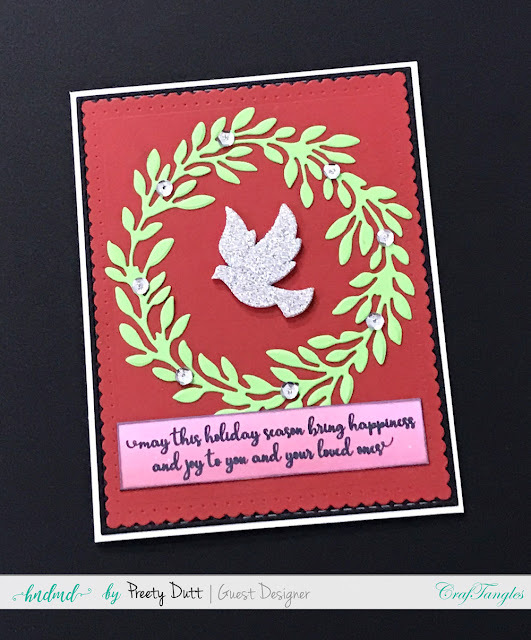 I used a glittery foam dove as the focal element and the wreath is a die cut, I used the vibrant CrafTangles Sap Green Cardstock to die cut the wreath & then embellished it with silver sequins. 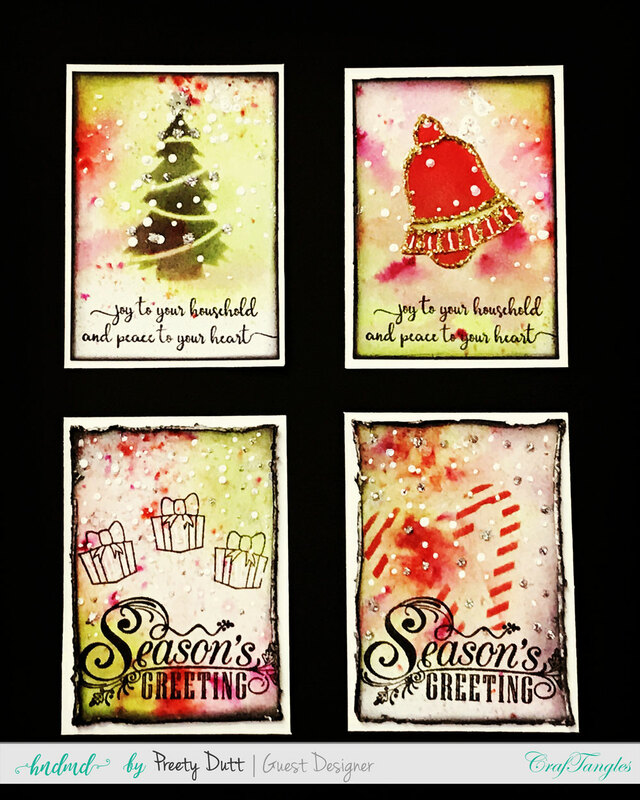 The organic looking backgrounds for these ATCs were created using Sprays and Pigment Powders. 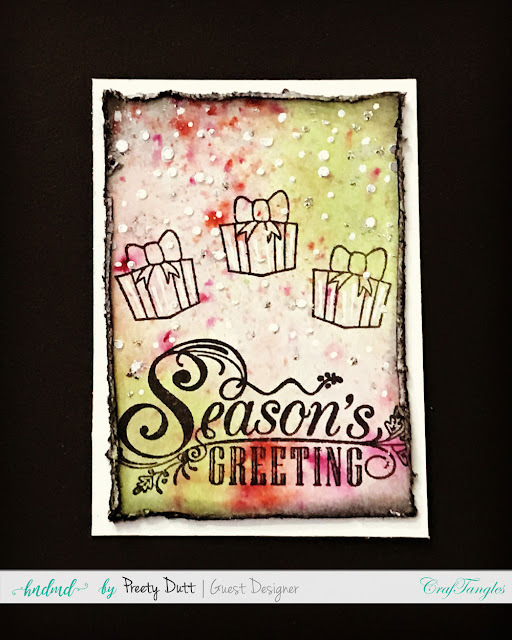 The sentiments were stamped using CrafTanglesSeasons Greeting Stamp & the focal elements were sponged on using distress oxides through the CrafTanglesChristmas Elements Stencil. 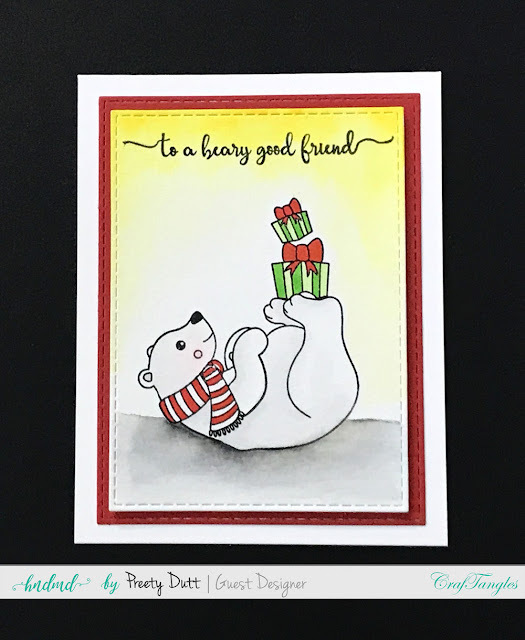 The gifts in one of the atcs were stamped using the CrafTangles Bearing Gifts Stamp. Snow was added using white gesso and the CrafTanglesSpeckles Stencil. The edges of 2 of the atcs were deckled and the edges of all the atcs were darkened & distressed with black soot distress ink. Details were added with silver stickes, antique gold perfect pearls, glitter and a white sharpie pen. In the end, the panels were adhered to white atc sized bases (2.5 by 3.5 inches) to give a finished look. Thanks a lot for your precious time! Wonderful cards and the ATCs are Awesome! !